Years ago – when I was old enough to know better, but still prone to stupid mistakes – my parents left me at home with a friend while they participated in a progressive dinner. They were hosting the main course, so they’d be back eventually, and my only instructions were not to touch the pot roast that was cooking upstairs. Cara and I were downstairs watching a movie when we got hungry and decided to make ramen. To this day, I’m not sure why I didn’t just pause the movie, go upstairs, and make the soup. But then again, hindsight is 20/20. I decided to boil water in the downstairs microwave, which was situated so that I could still see the TV. The next thing I knew there was a fire in the microwave. You see, the “still prone to stupid mistakes” part of me didn’t think about the fact that I had used a metal pot – with a plastic handle – to boil the water. It was the handle that caught on fire and was slowly burning up, blackening the formerly white microwave and stinking up the entire downstairs. I grabbed the first thing I could find – a ladle – and tried to fill it up with water to toss on the flames. Cara, the calmer of the two of us, pointed out that the bowl (next to the ladle) would hold more water. We safely extinguished the fire and nervously waited for my parents to get home. Even if I could have hidden the microwave, there was no hiding the smell. I remember wondering just how mad my parents would be, and what they’d say when they walked through the door. I thought there’d be more, but they had company coming, so my microwave-shenanigans weren’t fully addressed that night. Fast forward a few weeks to Christmas morning, opening our stockings. My mom has always been an expert stocking stuffer. She manages to find the perfect mix of fun doodads and incredibly useful things that you didn’t know you needed until you open them. But always smaller, lighter things (and each individually wrapped, to make it more fun). My stocking that year, however, was fully weighed down in the toe and as I made my way through the rest I was both excited and curious. The last thing I pulled out – the heavy thing – was probably about seven inches tall and cylindrical. And I couldn’t even begin to guess as to what it was. I certainly wasn’t expecting the huge can of heavy duty microwave cleaner. Though maybe I should have been. I imagine that my mom must have been smirking as I pulled off the wrapping, but I don’t remember that for a fact. I do know that, given the damage I did to the microwave, and the smell that permeated the house for at least a week, I was lucky that the cleaner wasn’t the only thing in my stocking that year. And no, I haven’t boiled water in the microwave since. I have a confession. And it’s not something I’m proud of. 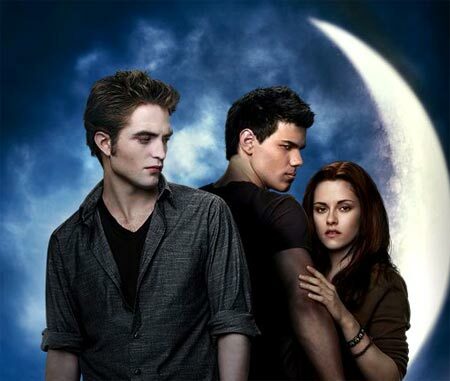 Back in November, when the new Twilight movie, New Moon, was coming out, I wrote about how bad I thought the first one was, and how I would not be seeing the second. And how I didn’t want to read the books (for fear of liking them). I still haven’t read the books. But Sunday afternoon, after a productive morning, mind you, all I wanted to do was veg out and watch a movie. And I didn’t want to re-watch anything I owned, so I looked on the interwebs. Now, maybe I was influenced by the recent ads showing the release of New Moon to DVD. Maybe I was just feeling particularly in touch with my inner (former?) teen angst. Maybe I just wanted to know if Taylor Lautner‘s abs looked as good as everyone said they did. Or maybe it was all of the above. Because I spent Sunday afternoon watching New Moon. There you have it. I caved. I fell to the power of Hollywood and boredom – a lethal combination. And you know what else? I didn’t hate it. Was it still a little melodramatic and absurd? Of course. Hello, teen angst! Do I still enjoy this LOLCats version of the movie? Well, how could I not? Do I still not fully agree with the glittery vampire idea? No, I don’t. Were the abs everything I thought they would be? And more. Wait, what? Sorry. I was just on a roll there. Anyway, I just thought you should know – in the interest of being honest. And, as much as I try to resist, I’ll probably end up seeing the third movie, too. Not in the theater, but who really cares about that distinction at this point? *I reserve the right to change my mind. Or cave, as the case may be. I don’t know who exactly in the office was responsible for choosing Thursday as the night for the holiday party, but I’d like to find out. And suggest that they try very﻿ hard for a Friday next year. Even after the deliciousness that was my bacon, egg and cheese breakfast sandwich, and the Aleve that’s trying so hard to work its way through my body, I’m still not quite at 100%. I am, however, enjoying the recap with some coworkers about both the party and the after party. One highlight from the party (aside from the fantastic food – crab cakes, bacon wrapped dates, mini pizzas – *drool*), was a conversation between a few of us and El Jefe, where we tried to convince him to give us today off. “So, you don’t mind if we come in late then?” we kept trying to confirm, after he implied that he would at least look the other way if we weren’t at our desks by 9am sharp. 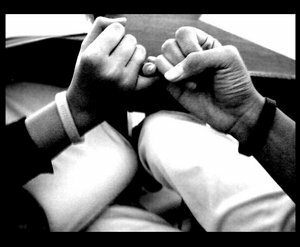 “But do you pinky swear?” Miche asked, holding out her little finger. He really wasn’t quite sure how to respond. I, Ken, promise not to be mad at Barbie for going out tonight. How sweet. I bet she fell in love with him all over again after that. Now, if you’ll excuse me, I have to go chug some water so I’ll be in any sort of shape to be social again tonight. 2) By the time I get out, there’s only an hour left until my holiday party! And I’ll probably appreciate the party even more then. 1) Setting your hair on fire. There’s always a risk when you mix alcohol and fire (think: candles, lighters, one of those crazy shots that I’m too scared to do), but do your very best to avoid this hazard. Burning hair smells terrible, and you kind of ruin the party for everyone else – especially when they have to put you out. 2) Staging an impromptu intervention. It’s a holiday party! Yes, most people will be drinking, and may imbibe more than normal. But this is not a time to sit in a circle and voice your concerns about one person’s behavior. Especially not when you can be standing by the bar with a coworker and judging several people at once. It’s called efficiency. 3) Blurting out a coworker’s secret in front of the entire room. Sure, the imagined satisfaction of stunning the rest of your coworkers with a juicy tidbit might be momentarily overwhelming. But think of how much more you could do if you just hang on to that secret, and use it at a more opportune time. Like when people are sober enough to remember it the next day. As always, please feel free to add your own. I need this job for at least another year. Update: Guess who got out of her meeting early, and still gets a free lunch?! Yay! Last week I mentioned that one of the things I was looking forward to while home was Black Friday shopping. Call me crazy, but it’s become tradition to get up at 4am, hit the sales, fight the crowds, then come home for a catnap – and revel in how much money I’ve saved. Within the past couple years, though, retailers have decided to take advantage of the craziness and make their extra-special-super-duper-how-could-you-miss-this? sales start earlier and earlier. Like midnight – only hours after you’ve stuffed yourself full of turkey, pie and wine. This year, my mother tried to convince me that we might be better served to attempt the midnight sales. “I just want to get it over and done with,” she told me. “Besides, I doubt the outlets will be that crowded – they weren’t last year.” I protested. I told her that I had already assured concerned friends that I was not that crazy. No midnight sales for me. In a conversation with Patrick, who also seemed to question my sanity, I had even professed that I was a Black Friday purist – a 4am shopper. But apparently, when at the mercy of She Who Wields the Credit Card (read: Mama), my ideals go down the drain. And so we devised a plan that would enable us to take advantage of the midnight sales, factoring in maximum nap time post dinner. 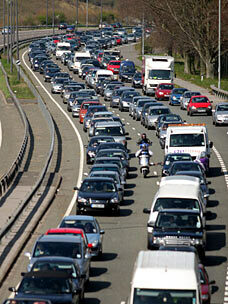 Traffic wasn’t bad last year, we reasoned, surely it would be similar this year. Right? We were on the road by 11:50pm, after a brief gas and caffeinated beverage stop, and we were making great time. I’m talking 30 miles in 30 minutes, give or take. We began to see a few more cars as we neared the outlets, and then, five miles out, traffic. just. stopped. Nothing but tail lights as far as the eye could see. Like that, but worse. And in the dark. What do you mean, I told you so? And so we sat. My mother drove, or, rather, sat behind the wheel and nudged the gas pedal every 20 minutes or so, and I dozed in and out of sleep in the passenger seat. Every now and then we took time off to curse at the jackass who was riding the shoulder, or laugh at the guy(s) who reversed back the on ramp when he saw the traffic mess in front of him. So when did we finally pull in the outlet parking lot? 2:50am. That’s right. Five miles in two and a half hours. And despite the eventual purchases made, I have to say, I am so not eager to repeat that. Next year’s alternate route planning starts now. (678): while 90% of the female population goes to worship a fictional character tonight at midnight, I will be taking advantage of having the bars ALL TO MYSELF. I guess that means it’s finally time for the new Twilight movie, doesn’t it? New Moon? I know that some people have been counting down to this. They feel the same way about Twilight as I do about Harry Potter. Except slightly more rabid. (Them, not me.) But I have a hard time getting behind the Twilight phenomenon. Anyway, because I haven’t read any of the books, my opinion of the series is based on the movie. Because, yes, I did see the first one. I love a good teen angst story as much as the next girl. I’ve thought Robert Pattinson was attractive ever since I saw him as Cedric Diggory. So I allowed a couple coworkers to convince me to go to the theater. That’s two hours of my life that I’ll never get back. For the second half, I was cringing because the awkwardness was just so palpable. And yes, teens are awkward, but it felt like awkward acting, as opposed to awkward adolescence. I’ve now found myself doing it again with New Moon. I know that I don’t actually want to see it. I didn’t enjoy the first one, why would I put myself through the second? And that’s exactly how I got sucked in the first time.